As I left work and neared my home at about 2:45 Thursday afternoon, I noticed yellow police tape strung between the trees and townhomes across the street from our house. I pulled into the driveway, stepped out of my car, and walked to the edge of the yard to see if I could determine what was happening. With my view partially obscured by an embankment, all I could see were the tops of police cars and a few heads bobbing back and forth. I walked inside and flipped on the TV to see if there was any news. It was about that time helicopters began to circle overhead. Not good. A single mother who apparently stabbed her two young daughters and herself Thursday afternoon in their well-kept Roseville townhouse may have been overwhelmed by stress and financial problems, a close friend said. Sylvia Sieferman, 60, and Hannah and Linnea Sieferman, both 11, were rushed to Regions Hospital in St. Paul after Sieferman repeatedly stabbed the girls and herself, police said. Roseville police and investigators from the Bureau of Criminal Apprehension were summoned to the Westwood Village III townhouse in the 400 block of County Road C around 2 p.m. after one of the girls, bleeding from stab wounds, ran to a neighbor's house for help. Sieferman and one of the girls are in critical condition, while the girl who ran for help is in stable condition, Roseville police Capt. Rick Mathwig said. How could a seemingly loving mother, who adopted two beautiful girls from China, suddenly snap and try to stab her daughters to death and then turn the knife on herself? Not only will these girls once again be orphaned (there's no way they will be reunited with their mother), they will be scarred for life, both physically and emotionally. Needless to say that as an adopting parent myself I was both horrified and infuriated. And humbled. Yes, humbled, "for all have sinned and fall short of the glory of God" (Romans 3:23). Incidents like this may seem perplexing until we begin to grasp the concept of total depravity. Doctors could come up with any number of psychological or neurological explanations, but what happened two days ago was the result of sin. And if it wasn't for the restraint of God's grace, any one of us would be capable of anything. 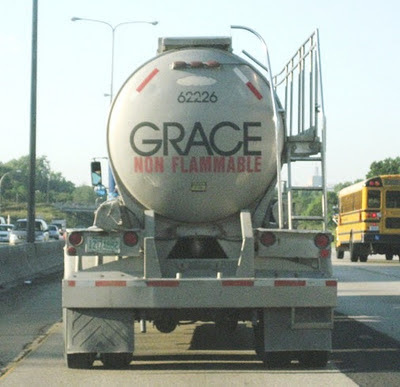 Grace is what keeps each person from exhibiting the full extent of our fallen, sinful nature. My hope and prayer is that God's sovereign grace will shine through for this family during this dark time. It is grace that can bring peace, comfort, and healing. More importantly, it is grace that brings us to faith in Christ, even in the midst of unimaginable pain and sorrow. Don't know how I feel about blaming such a situation on sin. Ultimately it is definitely because of sin because sin has scarred our existence with sickness, death, selfishness etc. However, that woman seems to be sick and need medical help. It doesn't take some people long to go from acknowledging problems are a result of sin, to telling mentally ill people that they just need to pray harder.